Summer is here, at least according to GOG. 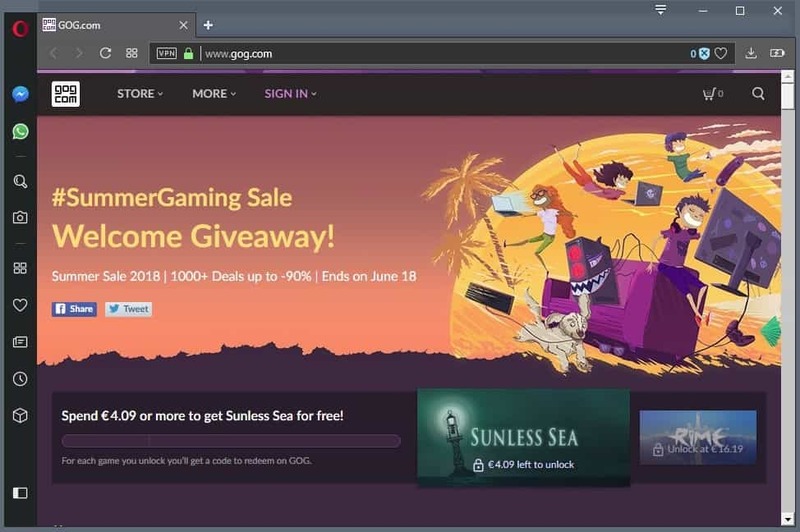 The company's annual Summer Sale started a moment ago and the company promises more than 1300 deals with discounts of up to 90%, free games that any Gog user can grab, and additional bonus games when your purchases hit certain thresholds. You can claim the game Xenonauts right now if you have an account or create one. The game, which is available for about $20 usually, is available for Windows, Mac and Linux devices. It is an X-Com like game in which you control a multi-national military organization that tries to defend Earth from an alien invasion. If you like turn-based strategy games with some simulation elements added to the mix you probably will like the game. To claim the game click on the "get for free" button on the GOG homepage. You are asked to sign in or create an account if you are not signed in already. The game is added to your account automatically and you can download it to your device or use the GOG Galaxy client to download and play it. GOG customers get two games as bonuses when their purchases cross the $5 and $20 mark. Sunless Sea is available when you spend at least $5, and RiME! is there for the taking if you buy games for at least $20 during the Summer Sale. The Summer Sale offers the usual range of discounted games. While you should not expect that all games are discounted by 90%, there are quite a few good ones that are. Here is a short selection of great games that you can snag for cheap during the Summer Sale. All games are discounted by 50% or more. Dragon Age Origins Ultimate Edition -- Dragon Age is a classic 3D roleplaying game that offers lots of content for the price. Classic Bioware game. Fallout: New Vegas Ultimate Edition -- arguably better than Bethesda's own Fallout 3 game, New Vegas is a must play for gamers who love Fallout and never played New Vegas before. Monkey Island I and II special editions -- classic adventure games that anyone can enjoy. Panzer Corps Grand Campaign -- A Panzer General type game that you play from the German perspective starting in 39 and ending with 45 in East and West. You can grab addons to play in Afrika, as the US, Allied or Soviet Corps as well. Shadow Warrior 2 -- If you like classic shooting games then you will love Shadow Warrior 2 as it delivers all that madness in modern graphics. Tyranny Commander Edition -- a good roleplaying game in which the armies of Evil have won the war against good. Master of Magic --- the 4x fantasy game is epic. I suggest you use the search to find games of interest or browse the available categories. You find plenty of classic games that will run on modern machines on GOG; great for buying them on the cheap and replaying them or playing them for the first time depending on your age. While many of the classic games don't offer great visuals anymore, they often offer great gameplay, game mechanics and value for the money. Now You: any games that you can recommend? great game if you like old school xcom or ufo defense. The modern xcom are great too but they really don’t play like old school xcom. Xenonauts does.